Yesterday I took two friends to Toraya, the traditional Japanese confectioner, for tea and wagashi sweets. I adore this cafe. Located on the lower level of Tokyo Midtown, the cafe and adjoining shop were designed by Hiroshi Naito, a superb architect who loves timber and frequently draws inspiration from Japan's rich architectural heritage. Naito terms this idea fueki ryuko or "a synthesis between tradition and innovation." The giant noren curtain adorned with the company crest and the square ceramic bricks that are the cafe's signature feature are perfect illustrations. Remarkably, the project exemplifies Naito's fresh vision but is also steeped in history. In the spirit of a Mackintosh tea shop, the cafe is beautifully appointed and, despite its location in what is essentially a vertical shopping mall, a popular spot for well-comported ladies of a particular refinement and stature. 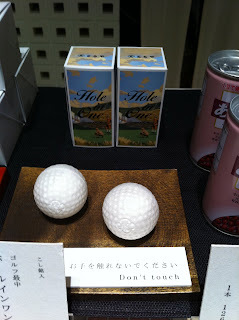 Keeping themselves current while they continue to produce some of Japan's most exquisite treats, the confectioner now includes anko filled (aka bean jam) golf balls among their offerings. They looked a little out of place next to the elegantly displayed slices of yokan paste and delicate tea cakes but I am sure they are a big seller. That wafer wrapping is a remarkable facsimile isn't it?